The Infrastructure sector has been the key driver for the Indian economy. The sector is critically important for sustaining the momentum of the economic growth, and the Government has undertaken policy interventions and initiatives to boost the sector. Foreign Direct Investment (FDI) received in the construction sector (including townships, housing and built-up infrastructure) from April 2000 to March 2017 is estimated at USD 24.3 billion. CII, over the years, has been working very closely with stakeholders across the infrastructure verticals to stimulate greater private sector investment. 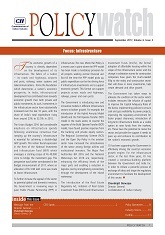 This edition of the Policy Watch focuses on the infrastructure sector.